The summer season and the first really warm beach days begin in May, with beautiful clear, sunny days and temperatures over 20 degrees C.
Between the months of June and September, the temperature of the sea is between 20 and 27degrees C.
How to approach Milos: You can travel by ship or by aeroplane. For tickets: Milos Travel Pirounakis. 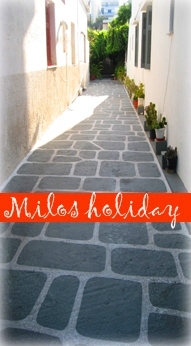 22870 22000, e-mail: travel@milostravel.gr. Click here for Ship Schedules. www.olympicairlines.com, Book tickets for aeroplane: 801 11 44444 , +30 210 9666666> e-mail: travel@milostravel.gr.